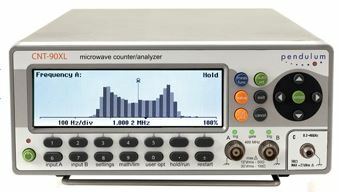 This RF/Microwave frequency counter/analyzer can be used to measure, analyze, and calibrate microwave frequency, power, and pulsed RF time parameters like pulse width and PRI. This system features a graphical display and improved control over measurement. The CNT-90XL Pulsed RF Microwave Frequency Counter/Analyzer provides pulsed measurements down to 30 ns, a speed of 250k measurements/s to internal memory, 14 digit display resolution, statistical analysis that includes histogram, trend, and modulation domain display, and much more.